The beautiful town homes at Villas at Tristant are located in Mountain Village. 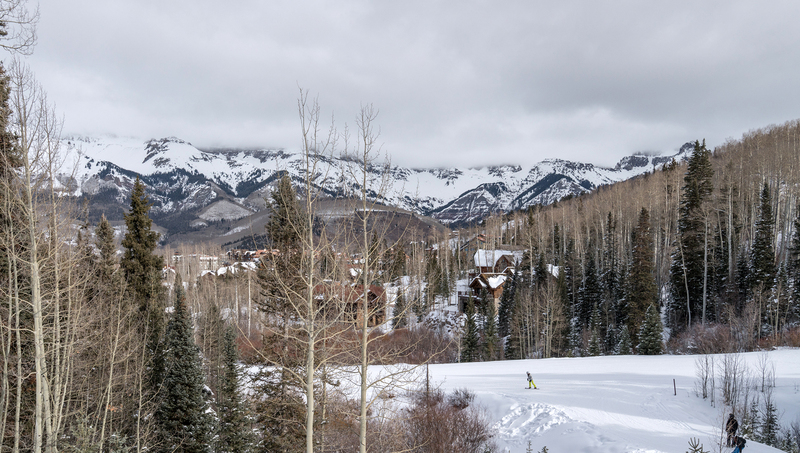 Each town home features a private garage, private outdoor hot tub and easy semi-private ski access, making them a favorites for families and groups of friends. 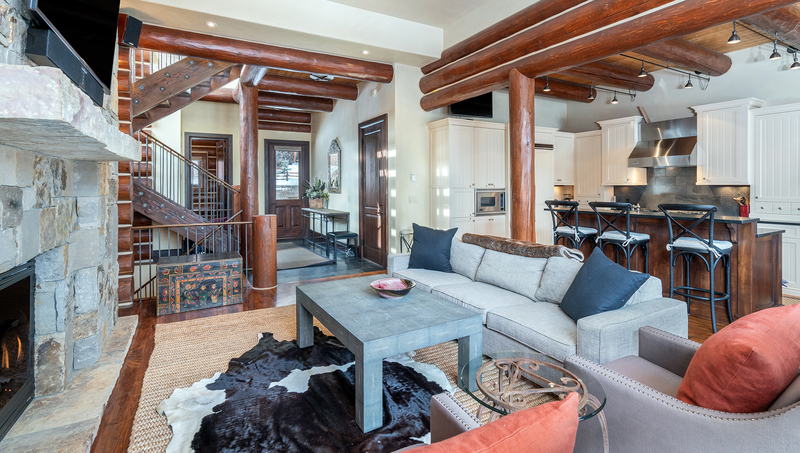 This mountain modern luxury residence will elevate your Telluride vacation. The four-bedroom pet-friendly end unit has ski-in/ski-out access, exquisite living spaces and upscale furnishes along with a panoramic view of the San Juans. Bedding: King bed, king bed, king bed, queen + twin bunk bed. Upon entering this unit, guests are welcomed into an open foyer with views of the entire main floor living space. Floor-to-ceiling windows with stellar views of the surrounding mountains accentuate the wood beam walls. 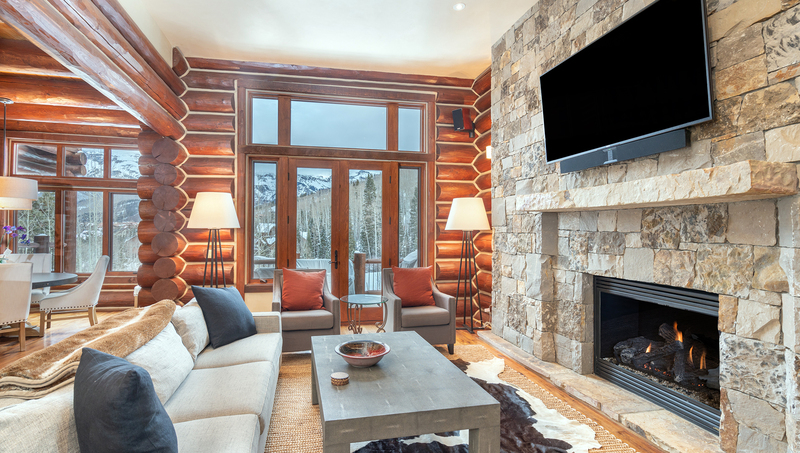 The living room features a large gas fireplace, mounted flat screen TV and surround sound for cuddling up next to the fire after a long day exploring Telluride. Doors from the living room open up to a large deck with seating and views of the direct ski access. The living room is open to the kitchen, which has a large island and seating for three at the breakfast bar. 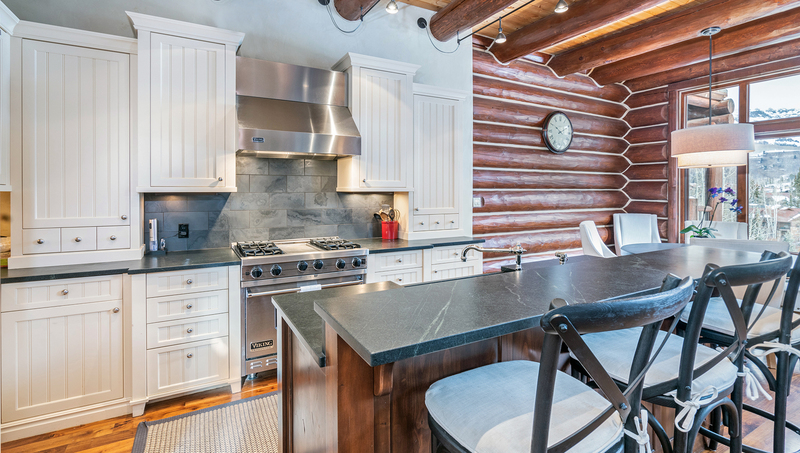 A built-in fridge and Viking appliances really bring cooking in this kitchen to the next level. The adjacent dining room seats up to six and has views from a picturesque window. A powder room and private garage finish off this floor. Up the open staircase is a loft and office area and two bedrooms. The master bedroom has beautiful vaulted ceilings, a king bed, a flat screen TV, sitting area and a large closet. The bathroom is equally as extravagant. It features a standalone soaking tub, walk-in shower with a rain shower head, double vanity and a separate water closet. The second bedroom is also spacious with a king bed, flat screen TV, views, and an en suite bathroom. This bathroom has a walk-in shower with a rain shower head and a single vanity. Upon descending to the lower level of this home, guests will find a second living space with a TV, comfortable couch, board games and a door leading to the ski run. A large full-size laundry room is also accessible from here. Two bedrooms are also located on this level and have direct access to a large patio with a hot tub. The third bedroom has a king bed, built-ins, a flat-screen TV and views of the mountains and hot tub. There is an en suite powder room, as well as a separate bathroom for a standalone shower and vanity. The fourth bedroom is a bunk room, with spacious sleeping quarters both on top and bottom, a flat-screen TV and access to the patio. There are two en suite bathroom spaces; the first has a double vanity and claw foot tub/shower combo, while the other is a small powder room. This home features one garage spot and one additional parking spot in the driveway. While there is a funicular that is available to guests of the Villas at Tristant, this home sits directly upon the Lower Village Bypass ski run with access alongside the unit. Free wifi is included with any stay.